Trailing 2-03 to 0-05 at half-time after goals from Gavin Crowley and Stephen O’Brien, they hit back with three green flags of their own after the break. Matthew Ruane and then Diarmuid O’Connor rippled the net and they led by just a single point in injury-time before Ciaran Tracey put the result beyond doubt. Mayo’s 12th league triumph and first since 2001 hadn’t looked likely early on. Sean O’Shea opened the scoring from a free but Mayo replied through Fergal Boland and Paddy Durcan to take the lead by the 10th minute. Keith Higgins then set up Ruane for a fisted score, one of three times the Connacht men opted to take their point rather than go for goal in the opening 35. Kerry had no intention of playing it safe though. In the 13th minute, David Clifford was allowed to wander infield and along the edge of the Kerry square before laying it off to Gavin Crowley, who sold a perfect dummy before drilling an angled shot past Rob Hennelly, recalled in place of David Clarke. Mayo fans might have been forgiven for thinking it was 2016 all over again as Hennelly didn’t have the best of halves. The Breaffy man flapped a shot out for a 45, missed two attempts from 45s himself and punched an attempted clearance straight up in the air that Clifford sent back over the bar. 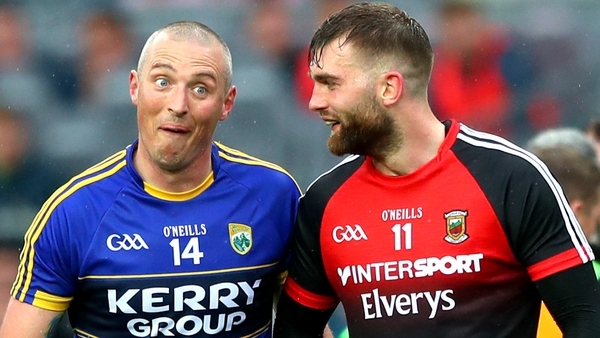 Jason Doherty got off the mark with a fine off-balance effort to make it 1-03 to 0-4 on 24 minutes before Kerry, their full-forward line tossing the ball around like the Harlem Globetrotters, struck again. Dara Moynihan picked out Stephen O’Brien, who scorched straight up the middle, leaving Higgins bamboozled, before planting a low shot past Hennelly. Mayo did have a goal chance just before the interval as Boland gathered a fine knockdown from O’Connor and sidestepped ‘keeper Shane Ryan, but he opted to take his point when faced with a tight angle and a defender back on the line and they went in four points behind. Mayo started the second half with intent, scoring three in a row in a row to rouse their fans, who far outnumbered their Kerry counterparts. James Carr got two points on his first start and was only denied a goal by Ryan’s outstretched leg – Darren Coen popped the loose ball over the bar. Carr also had a decent shout for a penalty but Fergal Kelly seemed to think he had gone down too easily under pressure from Peter Crowley. Kerry responded with two frees from Sean O’Shea (5f on the day) and a slickly-worked move finished by Gavin Crowley, but after that it was more Trotter brothers than Globetrotter as Mayo’s half-back line cleaned up and launched wave after wave of attacks. Ruane found the net after a neat exchange of handpasses with Darren Coen, and a sweetly struck effort from the outside of Diarmuid O’Connor’s boot was the first of three unanswered points before Jack Barry drew Kerry level in the 61st minute – 2-08 to 1-11. Then a hammer blow – Lee Keegan lofted in a high delivery and captain O’Connor beat Ryan and O’Shea to the ball and flicked it to the net. Kerry weren’t done yet. Sub Paul Geaney reduced the deficit to two and O’Shea picked up his second yellow to ensure a nervy finish. Hennelly atoned for his earlier wobbles with a superb point-blank save from Clifford in the first minute of injury-time but the Fossa youngster’s second of the day – he was the only Kingdom forward to score a point from play - cut the gap to the bare minimum with the seconds ticking down. Mayo hearts were in their mouths until veteran Andy Moran picked out fellow sub Tracey with a perfect pass over the top. A majority of the 44,257 present were screaming at him to take his point but the Ballina Stephenites man coolly slotted it past Ryan to make the game safe. 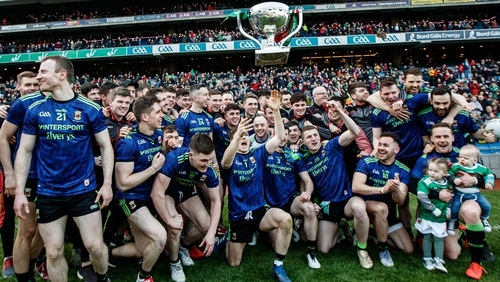 Kerry’s Diarmuid O’Connor was shown black and then red for a scuffle before the final whistle but it was his Mayo namesake who climbed the steps for the cup, securing the county’s first national title under returning manager James Horan. It also ends a ten-game sequence of failing to win finals at Croke Park. An omen of things to come later in the summer? Mayo: Robert Hennelly; Chris Barrett , Brendan Harrison, Keith Higgins ; Paddy Durcan (0-1), Lee Keegan, Donal Vaughan; Matthew Ruane (1-1), Aidan O’Shea; Fergal Boland (0-2), Jason Doherty (0-2, 1f), Diarmuid O'Connor (capt) (1-2); Kevin McLoughlin, Darren Coen (0-1), James Carr (0-2,1f).